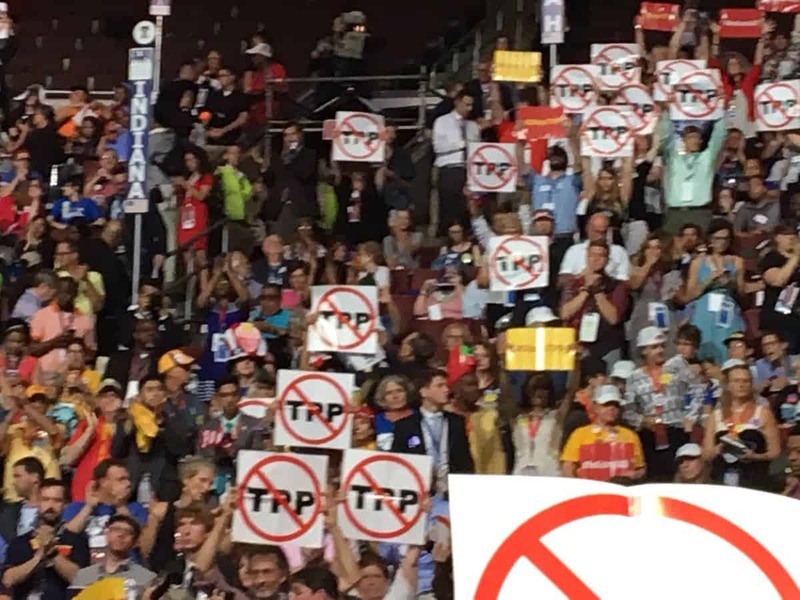 If you were watching the Democratic convention Monday night, you might have noticed a lot of “No TPP” signs in the crowd. These signs refer to the widespread opposition to the Trans-Pacific Partnership (TPP). They were in evidence when Bernie Sanders took his place at the convention podium as the Monday keynote speaker, on national prime-time TV, facing what was probably his largest audience of the campaign. Sanders tried to continue with the prepared text, saying, “Our job …” but was interrupted by continued chanting “No TPP, No TPP.” So he threw in an ad-libbed line, not included in the prepared text, saying ” … we have got to make sure that the TPP does not get to the floor of the Congress in the lame duck session.” The crowd erupted in cheers and applause. A source who was in the room at the time said the cheers were coming from, “Not just the Bernie crowd, the entire crowd cheered, throughout the whole hall.” This clip from C-Span captures the moment. And no wonder. TPP is a huge “free trade” agreement that is not really about trade. It is a “corporate rights” agreement that elevates the interests of giant corporations over the ability of governments to make decisions they consider to be in their national interests. Under TPP and similar agreements, if a country wants to enact a law or regulation or tariff that impedes a corporation’s ability to profit, it is prohibited and the corporation can sue the country in a special “corporate court” consisting of a panel of corporate attorneys. The decision of the corporate court is binding on the country, with no appeal allowed. Labor, environmental, consumer, human rights, LGBT, health care, faith, or other “stakeholder” groups are not given any similar ability to address violations under these agreements – only corporations. TPP is being pushed by Wall Street, giant multinational corporations, corporate lobbying arms like the Chamber of Commerce and non-Trump parts of the Republican Party, and, unfortunately President Obama. A recent poll found that many people do not know about TPP, but when presented with arguments from both sides, they come down solidly against it. A lot of people who didn’t know about TPP do now, thanks to Sanders’ speech at the convention.